We’d love your help. 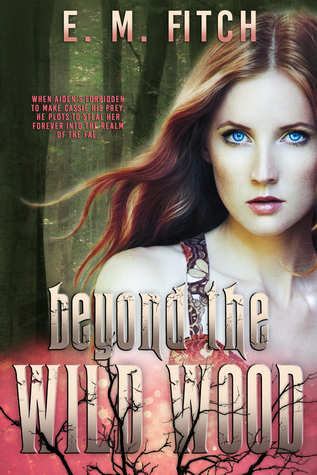 Let us know what’s wrong with this preview of Beyond the Wild Wood by E.M. Fitch. Cassie struggles to pick up what’s left of her life, keeping true to her promise to watch over her best friend’s son. But despite the faery queen’s promise of safety, the shadow of Aidan The faery queen has forbidden Aidan from stalking his prey, but Cassie should have known that nothing would keep him from what he wants: to steal her away forever into the realm of the Fae. To ask other readers questions about Beyond the Wild Wood, please sign up. What an explosive ending. It’s been a while since I read the first two books in the Of the Tree’s series and I’ll admit it if they are not fresh in your mind I would consider re-reading them before opening this little beauty. This is a continuous story and you must read the other books first. This is a tainted fairytale. The love of mundane shines through. Cassie wishes she didn’t know about the magical world of the Fae. She wishes her life was mundane and her best friend was still amongst the l What an explosive ending. It’s been a while since I read the first two books in the Of the Tree’s series and I’ll admit it if they are not fresh in your mind I would consider re-reading them before opening this little beauty. This is a continuous story and you must read the other books first. This is a tainted fairytale. The love of mundane shines through. Cassie wishes she didn’t know about the magical world of the Fae. She wishes her life was mundane and her best friend was still amongst the living. Cassie is in therapy after a tragedy took away her friend Laney. She can’t talk about fairies and she can tell the truth. The problems they are not done with her yet. Aidan is still lurking in the shadows. Ryan wants more from her but she is struggling to stay focused. The hidden world still calls to her and everything is about to come to a head. This book has a creepy under tone but it’s not scary. What if you don’t want to dream of the monster? What if you want to be left alone? This series shows a different side to the magical world. It’s creative and scary. It will draw you in and you’ll struggle to let go. I’ve enjoyed every minute. The ending is nigh. And it is bloody, despicable, and passionate. Cassie and her gang must finally once and for all face Aiden, and discover if their friendships will stand the test of the Fae or if they will disintegrate beneath Aiden’s manipulating hands. You do not want to miss the ending of this series! Every girl must grow into a woman and look reality in the face. Cassie’s reality happens to include a jealous fairy prince, hobgoblins gone wild, and a fairy queen as her BFF. Thankfully, she is grounded by a small group of people who believe in her and thank goodness for that…because fairies gone wild is a mild phrase for what happens to this small town. Buckle down for a wild ride that is sure to steal your breath as well as your heart. Erin Fitch’s third and last book in the series does not d Every girl must grow into a woman and look reality in the face. Cassie’s reality happens to include a jealous fairy prince, hobgoblins gone wild, and a fairy queen as her BFF. Thankfully, she is grounded by a small group of people who believe in her and thank goodness for that…because fairies gone wild is a mild phrase for what happens to this small town. Buckle down for a wild ride that is sure to steal your breath as well as your heart. Erin Fitch’s third and last book in the series does not disappoint! Jumping into Beyond the Wild Wood I had not been able to read the first 2 books in the series. Though there were a couple of storylines that were unclear in the beginning, I was able to catch up and follow the story the entire time. This is something that I absolutely admire in an author, when they can give their readers a glimpse into the previous novels without running on and on about them. Starting Beyond the Wild Wood, the tone was set for something huge! There is a showdown coming and it has been leading up to this point for a very long time. As I'm introduced to Cassie for the first time there is a sense of loss, vengeance, and determination. There is something so fierce in her that emanates from her soul, and that's probably the things I loved the most about her. Cassie seems to have grown up a lot from the beginning of her journey in this series, and you can just see it by her thought process, decision making and her intuition.